Vital Energi’s Biomass District Heating System at West Whitlawburn has attracted the interest of the Department for Energy and Climate Change (DECC), with a trio of senior members touring the facility. West Whitlawburn is a success story which has overcome the financial hurdles it faced and will have a state of the art biomass energy scheme. With one in seven homes in South Lanarkshire classed as in extreme fuel poverty this project can stand as an example of what dedicated, ambitious housing associations/co-operatives can achieve and how their residents can benefit. The project can proudly stand as an example of what can be achieved by UK housing associations/ co-operatives after they raised the £6.75 million for the biomass energy scheme from a mixture of Energy Company Obligation (ECO), Scottish Warm Homes Fund and the European Regional Development Grant Fund. When complete the 4.65MWt scheme will connect almost 550 homes, reducing their heating bills by an estimated 20 percent and lowering carbon emissions by over 48,000 tonnes over the project’s 30 year lifecycle. Clive Maxwell – Director General for Consumers and Households, Angie Ridgwell – Director General for Finance and Corporate Services and Susannah Storey – Director of Strategy all attended a recent tour of the facility and were particularly interested to see how DECC can provide support for projects like West Whitlawburn. 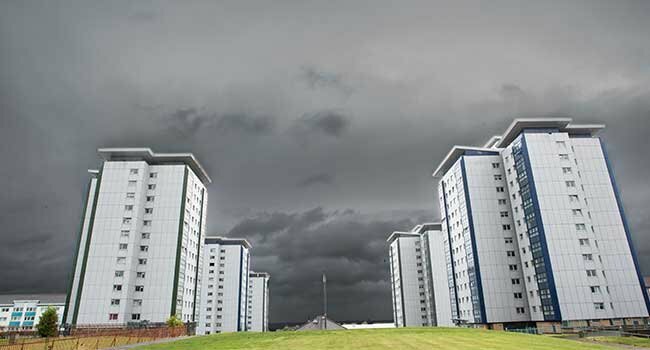 If you’d like more information about the financial options open to Housing Associations and Co-operatives Vital Energi have published an article entitled “Bridging the Funding Gap.” which can be accessed here.